Itchy eyes and inflamed, sore or flaky eyelids, sometimes with scaly crusting, are symptomatic of both eye eczema and of blepharitis, a condition that is as much a skin problem as an eye disorder. This affects the eyelashes and is often due to the hair follicles becoming infected with the staphylococcus aureus bacterium that everyone carries on the skin. Anterior blepharitis can also be caused by yeasts on the skin causing itching and flaking of the scalp, ear canals and eyelids, a bit like dandruff of the eyelids. This is when the oil glands that line each eyelid become blocked, leading to a build-up of bacteria, causing inflammation, redness and recurrent styes. Your GP may prescribe oral antibiotics or antibiotic drops, but cleaning the eye area diligently every day is really the key to clearing this difficult-to-treat area. It's very important to get rid of any bacteria that will make the problem worse. Wring out a muslin cloth or flannel in warm water and apply it as a compress to each eye for 30 seconds. Then dip the end of a cotton bud in diluted baby shampoo - about half shampoo, half warm water - and gently rub the bud a few times along the eyelids from where the lashes grow out and where it is flaky and red. Do this daily and after a few weeks you will be able to drop this to once a day or alternate days if things have improved. These are a common problem, especially for women, and can be caused by a variety of allergic reactions and autoimmune diseases. The skin over the eyelids is very thin, and is especially susceptible to contact dermatitis caused by cosmetics that are directly applied to the eyelids, such as eye shadow or eye liner. These cosmetics may contain various antigens causing the rash, such as formaldehyde or quaternium-15. 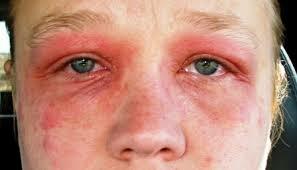 Thimerasol, a preservative widely used in cosmetics can also lead to eye allergy. Annoyingly for those who wear contact lenses, thimerasol is used in almost all contact lens solutions, so if you use a natural mascara or eyeliner free from thimerasol and still suffer symptoms it could be your contact lens solution that is causing the allergic reaction. Eye cosmetics that have a green or blue colour may contain nickel or cobalt, which are common causes of contact dermatitis. Mascara can cause eyelid dermatitis too, either from formaldehyde/quaternium-15 or from the nickel present in the applicator wand. The nickel in eyelash curlers can also cause eyelid dermatitis. The chemicals used on the scalp in hair dye, shampoo and conditioner can cause eyelid irritation even if there isn’t initially a rash on the scalp, where the skin is thick. Hairspray can similarly cause eyelid dermatitis as the spray settles on the closed eyelids of the user. Eyelid dermatitis can even be caused by chemicals present on the hands which are transferred to the eyelids when touching the face. You might be surprised how often you touch this area, but nail polish and nail resins/hardeners are quite common causes of contact dermatitis on the face and around the eyes for this reason. Atopic Dermatitis can show as eyelid dermatitis as a result of allergies to pollens, pet dander, mould spores and dustmites. Typically atopic eczema affects other areas of the body as well, especially the flexure areas behind the knees and on the inner elbows but the eyelids alone may be affected, especially in adults. Some food allergies may also be the cause of atopic eczema that flares up on the face and eyelids, particularly in children. Whether the eyelid rash is caused by contact or atopic dermatitis, various skin creams may be useful for treating the symptoms. The skin on the eyelids is particularly susceptible to the side effects of topical steroids, and getting these medications into the eyes can result in glaucoma or the formation of cataracts. So your doctor may suggest low potency topical steroids, such as over-the-counter strength hydrocortisone cream, used sparingly, short-term, and with extreme caution on the eyelids. Alternative creams that can be used on the face include the topical calcineurin inhibitors (TCIs), Elidel and Protopic. Unlike topical steroids, TCIs do not cause many of the side effects of topical steroids, nor do they lose effectiveness with prolonged use. In addition, TCIs can be used on any skin, including the eyelids. Try not to touch or rub your eyes and avoid touching your eyes whilst wearing ordinary nail polish as this can causes allergic reactions round the eyes. Instead, try water-based nail polish and a natural nail polish remover. The wands of out-of-date mascara are a breeding ground for bacteria as are unwashed eyeliner brushes. Try Suncoat Natural Mascara which is specially made for eye allergies and NatOrigin Eyeliner Pencil for sensitive eyes. Test for nickel in mascara applicators and eyelash curlers. Use a natural chemical-free hairspray. Test for Cat Allergy which can cause eye eczema. Allergy to tomatoes and foods in the nightshade family have also been implicated in eye eczema so you could coinsider avoiding these. Most people find wearing a Dermasilk therapeutic eye mask overnight particularly beneficial. Try smearing your eyelids with manuka honey. Leave 3 hours. Wash off gently. Many sufferers swear by this simple remedy. The information AllergyBestBuys provides should not be considered medical advice, nor is it intended to replace consultation with a qualified physician.